From Backgammon Times, Volume 2, Number 1, Winter 1982. Conservation and saving energy are such commonplace ideas in modern life that they are taken for granted. Yet it took a long time for these concepts to find acceptance in our consumer oriented world. Even today the disastrous notion that "there's plenty more where that came from" still commands a powerful lobby. Backgammon experts also practice conserving energy in a manner of speaking. Take for instance the position in Diagram 1. In my notes to the Tomchin-Robertie match at Monte Carlo, 1981, I made the following comments. An unusual but correct move. Robertie approaches the edge of the enemy prime before it is formed. The two other moves (6/4(2) and 8/7(2), 6/5, 11/10) only serve to equalize the game once Tomchin makes his bar point. Making Tomchin's three point is at least as good as making his own bar point or four point, so Robertie makes the point which is hardest to make. This still gives him the same potential to make the other desired points on his next few rolls. When you have a choice between two equally desirable points, choose the point which requires the fewest numbers to make. Robertie's excellent move was an example of conserving energy in his position. 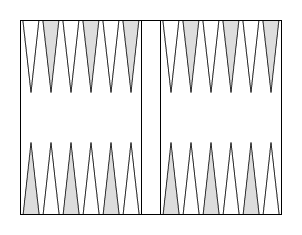 Energy in backgammon can be defined as "the capacity of a position to improve itself effectively." Let me explain further. A position's ability to block or attack enemy checkers is determined by the number of builders it has bearing on vital parts of the board and how well diversified these builders are. The greater the number of builders and the greater their diversification, the more likely it is that the position will improve. If Robertie had made his four point or bar point with double aces he would have in effect deprived himself of the opportunity to make Tomchin's three point. Furthermore, he would have used up some of the builders that gave his position the potential to improve. By reversing the order of plays Robertie preserved the energy in his position. Let's look at two more examples. Diagram 2 shows White with a 4-2 to play. Here it is correct to make the four point. White then preserves excellent chances to make his bar next turn. Making the bar would reduce White's chances of making the four point to only a few numbers; and it might not be until the distant future. Diagram 3 shows White to play a 6-1. In contrast to the previous example, the correct play here is to make the bar, for very much the same reasons it was right to make the four point in the last example. Preserve your builders, keep them diversified and your positions will continue to improve with regularity. They will in fact be energized.